Our annual Christmas Luncheon was held on December 1, 2018. What follows is a description of the event provided by Board member Susan Jenkins Meers with photos by Leslie Spencer and video by Ed Brown. Almost 50 people enjoyed each other’s company at the luncheon. It’s that wonderful time of year again. 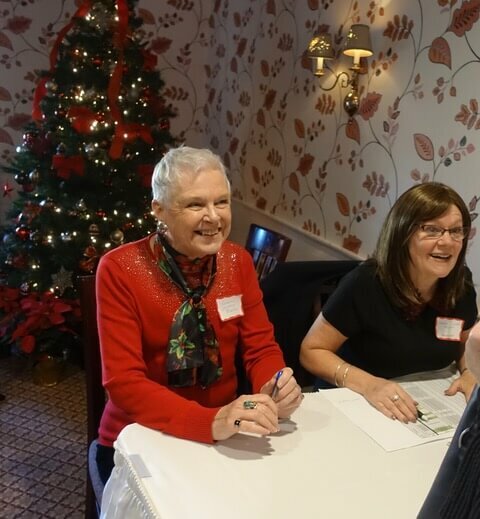 Last year’s Christmas Luncheon was such a success, it was decided to return to the cozy and warm atmosphere of the c.1789 Storrowton Tavern in West Springfield, MA which was once owned by John Atkinson, a revolutionary war veteran. Attendance was high with old friends and new, reflecting a resurgence of interest in our Welsh roots and an overall love of Wales. Andrea and Straford Wild playfully perform together as BOTH WILD. For many of us it was the first experience of the Welsh tradition hymns of PLYGAIN (pronounced Pl-ga (long i)-n. This is an old tradition in Wales, dating from the 16th century, of singing from 3-6am on Christmas morning. In these early hours, men gathered in rural churches singing, mainly unaccompanied, three or four part harmony carols in a service that went on for three hours or so. In later years women and children joined in Plygain services. When families returned home in the wee small hours, children usually returned to bed while festivities were prepared. It wasn’t until after these services that family celebrations of Christmas Day commenced and the feasting would begin. The two Plygain sung at the luncheon were soulful and they pulled at the hiraeth of our hearts. Straford and Andrea were warmly applauded and celebrated. It was a glorious day of celebration of the season, our Welsh heritage and history. Nadolig Llawen and Blwyddyn Newydd Dda, everyone.